AAA approved Christian resort with AAA approved group lodging accommodations, group amenities and a variety of essential services. 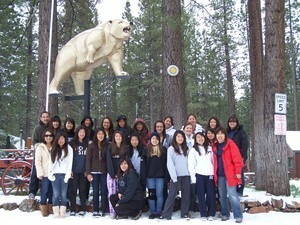 Big Bear Lake is Southern California's premier four-season group vacation destination. World famous Golden Bear Cottages accommodates over 200 guests with rustic mountain group cabin accommodations small and large. 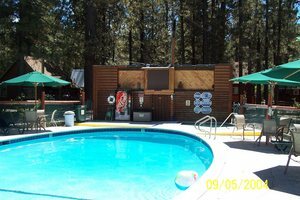 and our AAA approved big cabins in Big Bear Lake are best for groups of 20 to 200.
follow us on Facebook Golden Bear Cottages "AAA approved cabins for groups"
Sports Team Group Travel Lodging Reservations, AAA approved! Activities and group events in the Big Bear Valley include hiking and trail information, mountain biking and running, guided Bald Eagle Tours or off-road adventures. Team travel accommodations for sports teams and groups of all sizes are available. The Golden Bear Cottages Gift Shop and Visitor's Information Center is staffed with knowledgeable family associates (real local people) who have answers to all of your questions, including the weather. They will direct you to the best information about large family and group lodging, dining and how to find special vacation values. You'll also find maps for your group including: hiking, biking, fishing, boating, swim beaches, parks, picnic and recreational areas. Stop by for directions to The Discovery Center, The Moonridge Zoo, the Big Bear Museum, the Big Bear Lake Preforming Arts Center, local marina discounts for groups at Pleasure Point and our three ski resorts. 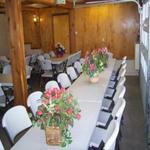 We accommodate fraternity and sorority groups, team travel, church and school retreats too. Golden Bear Cottages considers it a great honor to carry on the role of protecting and sharing the beauty of the California historic pine forests with our guests. Our goal is to nurture an environment in harmony with the nature and history of the mountain while allowing our guests to enjoy a relaxing Big Bear Lake alpine experience. We strive to make our resort an antidote to all that is excessive, formal, artificial or contrived. By focusing on the very essence of life, we hope to offer our family and group lodging guests a welcome retreat that always is in tune with the spirit of the mountains. 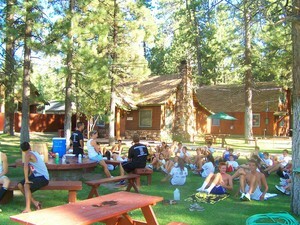 INDOOR GROUP MEETING SPACE, OUTDOOR RECREATION ON OUR 5 ACRE RESORT. "AAA approved cabins for groups"
Pet travel guide for dogs of ALL sizes. Pet friendly group cabins. Our clean, large Big Bear Lake group Cabin Rentals accommodate pets for group retreats, reunions & mountain conferences too! 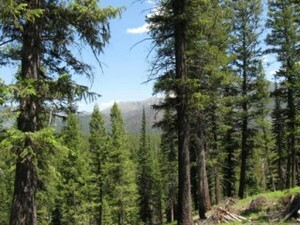 Our cabins are clean, comfortable and located within a five-acre forest area of 300 historic pines. Golden Bear Cottages is truly an historic mountain property, not a five star hotel. If you are looking for a peaceful and quiet vacation resort with a heated pool and spa, lots of outdoor activities and a staff that truly appreciates you and your family or group of any size, then this is the place for you! If you plan on bringing your pet, make sure you are choosing a pet cabin where pets are welcome. Our specially Designated Pet Friendly cabins at Golden Bear Cottages have a fully fenced pet yard. 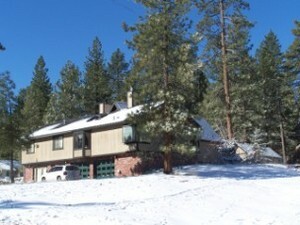 Clean AAA approved resort cabins, Big Bear's closest to the all three famous Ski Resorts. 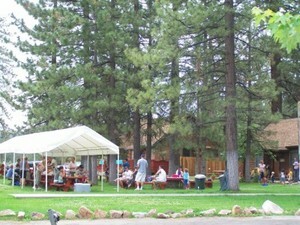 Golden Bear Cottages resort is the best Big Bear Lake destination to hold retreats, Big Bear Lake AAA approved family group vacation rentals, group conference or family reunion in Big Bear Lake, one of Best Resort Lodges that are Pet Friendly with Group accommodation discounts for schools and churches. 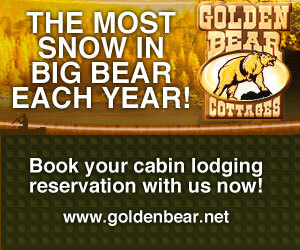 Best place to stay AAA approved cabins: Big Bear big cabins not a hotel, it's a non-hotel. GROUP CABIN RENTAL PRICES FOR THANKSGIVING, CHRISTMAS AND OTHER MAJOR HOLIDAYS ARE THE SAME AS OUR HIGH SEASON RENTAL RATES, BUT THESE CABIN RESERVATIONS HAVE LONGER MINIMUM STAYS DEPENDING ON THE HOLIDAY. World famous Big Bear Lake cabins. 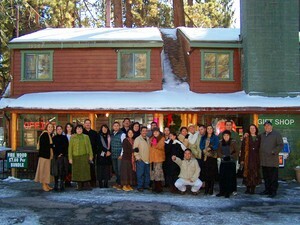 Southern California Tour Bus Group Resort Destination with mountain accommodations for groups from 20 to 200 guests in our world famous Big Bear Lake historic big cabins. our 33% discount policy for returning 3 day group events at Golden Bear Cottages Resort. Free Night - To receive a free night, guest must book their cabin before leaving this year or prior to deadline. Free night can be used (with a minimum of 2 paid days) on either Thursday before the weekend event or the Sunday at the end of the event. Deposit for next year's event must be a minimum of 25% or $100.00. A second 25% will be due 90 days from event departure date. The balance will be due upon arrival at next year's event. This deposit guarantees your cabin, and there are no refunds, but another group member may take your cabin if there is a reason you cannot attend next year's event. Automatic free date change if event date changes. Thank you for taking advantage of our special returning group offer for our very special friends who attend these annual group events. 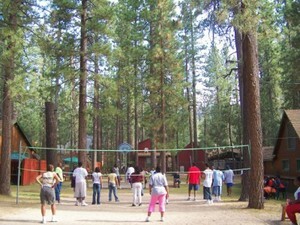 Best family vacations in Southern California are at Golden Bear Cottages Resort. 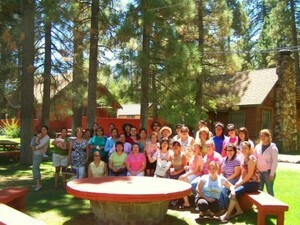 Best Family Cabins, California, 2009-2013 rated the best place to stay in Big Bear Lake for groups, club travel, school and church retreats, family reunions, AAA approved group meetings and weddings. This is where to go for any type of outdoor family or group activity using your 4x4, bike, quad or SxS. The maps are available FREE at our office in Big Bear Lake. The Big Bear Lake Marketing Association through it's partnerships is responsible for the development and daily management of 13 websites consisting of group lodging, accommodations, resort cabins, vacations, news and reviews. We daily update over 30 news stories about Big Bear events and weather. We manage over 3850 landing pages of discount coupons and vacation planning. The websites have over 1370 current photos of the drive to the mountains, the four seasons, resort cabin interiors and exteriors & events of local interest for families and groups; featuring small and large Big Bear lake cabins for rent. Golden Bear Cottages Resort is a member in good standing with the BBLMA. Big Bear Lake is Southern California's only four-season resort, ... More than 6 million visitors recreate on the San Bernardino National Forest every year in Big Bear Lake. Over 25,000 of them choose to stay in a rustic mountain cabin at AAA approved Golden Bear Cottages non-hotel resort at 39367 Big Bear Blvd., just one block from the lake. 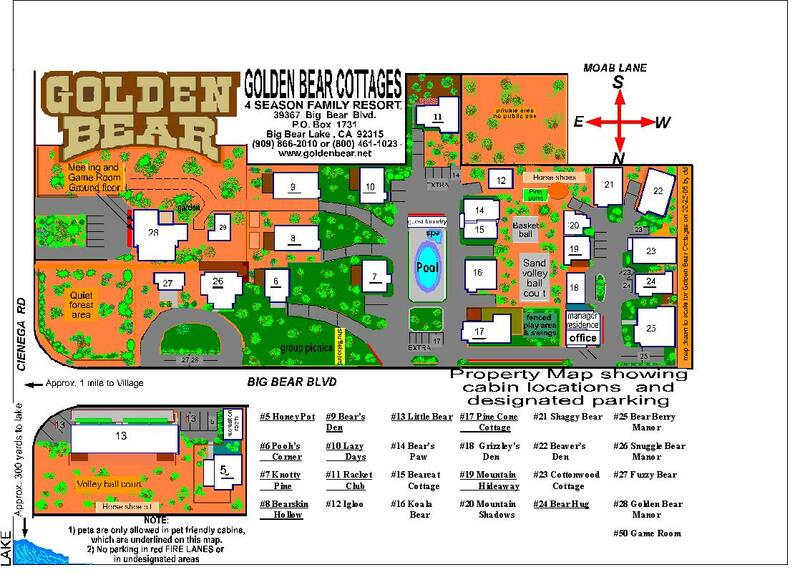 Golden Bear Cottages resort group vacation rentals are available for as few as two nights -- for weekend getaways or vacations. When you choose our vacation rentals at Golden Bear Cottages non-hotel, your group gets more space for less money than hotels in the region. Cabins for big groups and families, and cottages perfect for couples looking to get off the grid, and everyone in between at this Big Bear Lake non-hotel. Southern California Tour Bus Group Resort Destination with AAA approved mountain group lodging accommodations from small groups of 20 to big groups of 200 guests. Services: Travel Advisors, Vacation Packages, AAA Member Discounts, Trip Advisor.